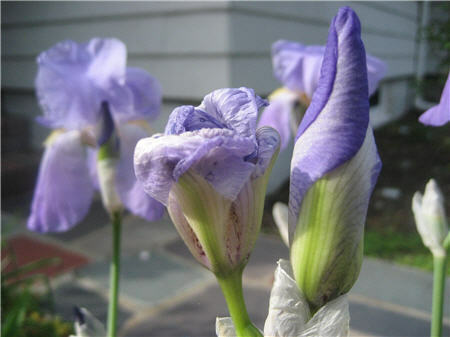 I always forget how magnificent our irises are when in full bloom. The photos don’t really do them justice. Right now there is a wall of irises rising up between our driveway and our front sidewalk. The bulbs, which come from my grandmother Jarrett via my father, are really in action this spring and have created a spectacular wall of purple. The wall of iris is reassuring because it’s a risky year for our plantings. We ripped out the remaining “legacy bushes” (big dense evergreens) in front of the house last fall when we redid our front steps. Against all odds the rhododendrons and compact evergreens we planted in their stead survived the winter and are blooming like crazy, but there’s still a lot of empty space to fill with plants. Cue a lot of annuals and perennials purchased and dug in over the past month, and you can understand my relief when the irises simply, reliably, just came up and bloomed. Also, I built a raised garden bed a few weekends ago. The tomato plants are in, the basil and cilantro haven’t died yet, and the peas and lettuce are just starting to poke their way above the soil. Finally, we hacked away some of the old growth along our back fence, taking down a nasty thornbush and some subpar “bridal wreath”, and found a big cherry tree hiding among the detritus. Hopefully opening it up will give the cherry the room to breathe and grow that it needs.